Shopping with Their Eyes - Produce Buyers | Zero Zone, Inc. Shopping with Their Eyes – Zero Zone, Inc. When it comes to produce, truth be told, consumers shop with their eyes. Passing over perfectly good, but less than “perfect-looking” produce is part of the reason for the massive food waste problem in the United States. While some are taking steps toward changing the paradigm of consumers who are passing over perfectly safe, but blemished produce, there is a long way to go before consumers will stop shopping with their eyes. So what can food retailers do to help reduce food waste while putting more money their pockets? The Crystal™ Merchandiser line of reach-in refrigerated display cases from Zero Zone is perfect for produce. 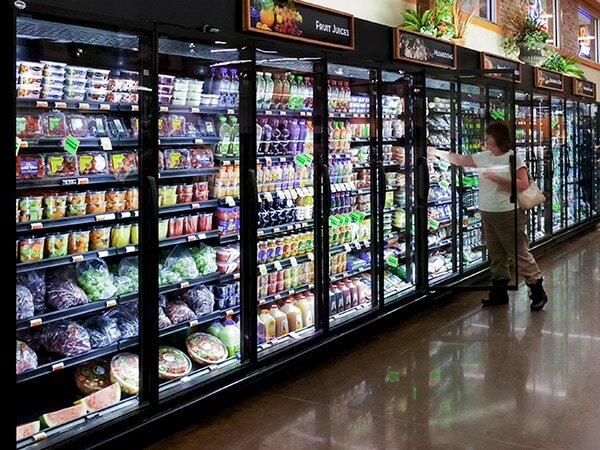 Fresh cut fruits and vegetables and bagged salad mixes are just a few of the produce items that could benefit from the longer shelf-life that the Crystal™ Merchandiser provides. Not only will your produce stay fresher behind glass doors instead of open cases (up to 50% less shrink), but it retains it’s visual appeal longer… and that means more sales… and less waste.